blis-online stands for “Business Location Information System” and offers a modular system for marketing, monitoring and managing commercial sites and real estate. blis-online’s attractive appearance conceals a powerful and comprehensive planning and management tool-box for both, business promoters and planners. Over 300 German and international clients benefited so far from blis-online’s innovative approach. blis-online is modern, cloud-based, modular, flexible, easy to personalize and integrate and immediately ready-to-use. Our ‘data-at-the-source’ approach avoids parallel and isolated structures as well as multiple duplications. For the client this means a truly cost-efficient and integrated solution. gisTRA® – Gewerbeflächen-Informationsportal der Technologieregion Aachen. Role model for a regional business portal created via blis-online (including regional and municipal subsidiaries) gisTRA® – Gewerbeflächen-Informationssystem der Technologieregion Aachen (www.gistra.de). 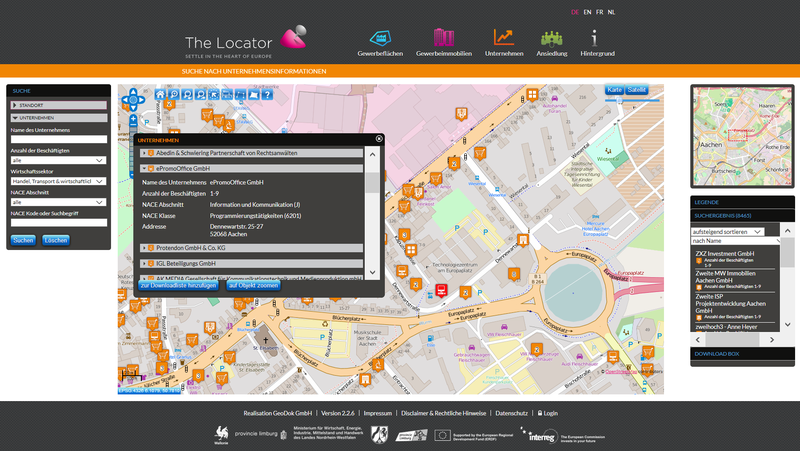 „The Locator “ is the first comprehensive cross-border location information system in Europe. It was developed as part of an INTERREG project and combines two GeoDok platforms, namely gisTRA® on the German and REBIS on the Dutch side of the joint national border, as well as two other regional systems from Belgium. 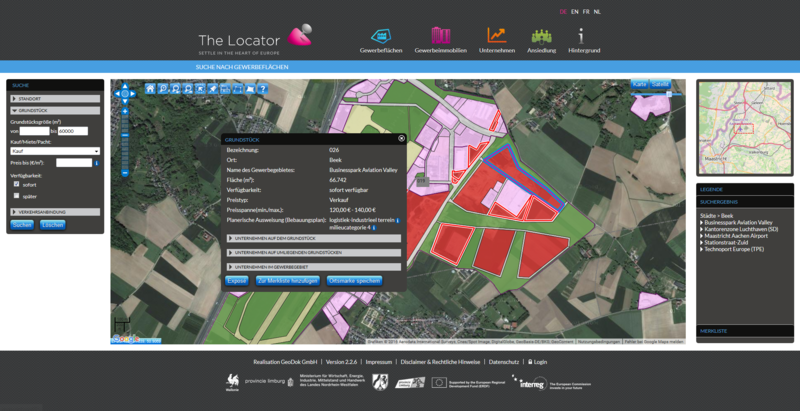 From project to product: Many modules from The Locator have already been incorporated into blis-online (www.the-locator.eu). The images show two marketing of views: the search for industrial sites and company informations.